After a harrowing series of landlord conflicts (and floods, and gas outages) LeNell Smothers has lost her lease and closed her nouveau-bordello styled liquor shop in Red Hook, Brooklyn. The place has never been my sort of drink, but I’ll miss it anyway. Every bar is gimmicky. Everyone has some sort of shtick. I don't think it's a bad thing. Is it gimmicky to have a phone booth that you walk through? Of course it is. Is it gimmicky to have chandeliers hanging and a big fat wooden door? Of course it is. Is it gimmicky to have girls dancing on a bar? Of course it is. This is breathtakingly cynical. Surely it’s true that New York is chock full of gimmick-first venues, but that doesn’t mean that “everyone has a schtick.” Lots of the best places (be they restaurants, bars, liquor stores, yarn shops) are organic reflections of the judgment and enthusiasm of the owner. Other places are branded manifestations of an invention of the owner. The former wins every time. Although, I suppose the liquor store I shop in (most often, anyway) has a gimmick: It’s huge, well stocked, and the prices are good. This is not to say that I’m happy to see LeNell’s gone. She was, after all, the matchless queen of bourbon in New York City. Her selection was without equal. She somehow managed to glide past the rule that liquor stores in New York cannot sell things which are not liquor and carried a wide selection of excellent bitters. I grabbed a bottle of The Bitter Truth’s Lemon Bitters while I watched and eavesdropped as LeNell worked through the shop’s final hours. It was an interesting scene. She did a photo shoot -- she got naked and lounged in her bathtub by the front door of the shop, covered in bottles of gin -- but most of the day was spent receiving teary eyed customers who brought her a strange assortment of gifts (chocolates, xeroxes of vintage Gourmet Magazine issues) and plucked the bones of her shop clean. She even sold a bottle of Bols Genever from the photo shoot. “This one was covering my right breast,” she announced. How does one get a Dacha, anyway? It’s sometimes hard to tell if a story is hopeful or grim, and certainly the recent dispatch from Russia in Time is puzzling in just this way. People are drinking perfume, for crying out loud. The bright side: the remedy involves cooking up batches of homemade hooch in stove-top stills. 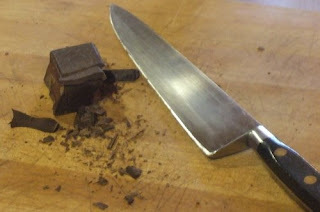 Roughly chop the chocolate until it is the size of chunky, irregular chocolate chips and shavings. Put the chocolate in the jar. 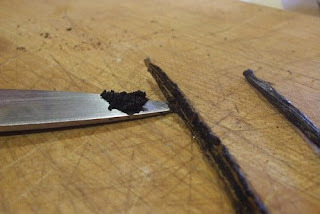 Split the vanilla beans in half and scrape out the insides with the edge of a sharp knife. The scrapings look like something between sevruga caviar and hashish. Put the scrapings in the jar, chop the husks into inch lengths, and put those in the jar, as well. Put the mixture on a shelf and shake it every day or so for a month. The last time I made this, I used sugar cane chunks. I want it to be a little sweeter this time, so I’m going to make cane sugar syrup (one measure cane sugar to one measure water, bring it to a boil in a saucepan, turn off the heat, pour it into a bottle -- it’s good to have it around for cocktails). 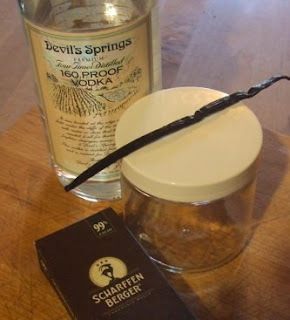 When the tincture is done, in a month or so, pour it through a strainer into another jar and slowly add some cane syrup. I’m thinking that I’ll add about a quarter of a cup. A word of warning: do not leave the chocolate in the jar indefinitely. With some tinctures this looks really neat, but the chocolate absorbs fluid and inflates like one of those sponge toys that grow in water. Eventually, all you’ve got is a disgusting, spongy, pale jar of what looks and feels like a chocolate mousse. Put a few drops of absinthe in a cocktail glass and swirl it around to thoroughly coat the inside of the glass. Discard the absinthe. Combine rye, averna, and bitters in a pint glass filled 2/3rds with ice and stir with a cocktail spoon for about thirty seconds. Strain the drink into the absinthe-rinsed cocktail glass and garnish with a twist of lemon. I ate these wonderful bones at the Moonshiner's Jamboree in Climax, Virginia. There's no moonshine to be had. Your inquiries will be met with icy stares. George Plimpton used to love to tell the story of how he asked the first son of the Aga Khan for money to finance the Paris Review as together they ran from the bulls in Pamplona: "Yes! Yes, I will!" (Read about it here, or here). Whatever desire I harbored to run with those animals in Spain has been supplanted. I recently learned that the bulls run in Tlacotalpan every year. It's the best news to flip through my virtual transom in a long time. There's more here to pique my interest than simply a bunch of crazed bulls goring the townsfolk. milk and fruit or peanut flavoring. The wanton disregard for the safety of, well, everyone and everything is admirable. Years ago, I spent a rollicking weekend roaming around New York City with some buddies. We were underage, but the City in those days was not the sort of place that worried about technicalities. Two of us found ourselves in the bar at the Gramercy Park Hotel. This was not the Schrager redesigned Gramercy, just an old-school New York hotel with a dark, woody bar. I remember it was silent and empty. The barman was tightly wound up in a white vest, and he regarded us with weary indulgence as we approached the bar. We were slick kids, and we posed the question thusly: “Can we charge drinks to the room?” Dealing with the issue of whether or not they’d serve them to us at all en passant. The answer was yes. We wanted to pump our fists up and down and hiss “Yes!” but we kept ourselves together. Inside, however, I was a roiling mess of anxiety. Having successfully stepped up to the plate, I was now called upon to swing the bat. I had no idea what to order. What do people drink? What do grown-ups drink? I drank Rolling Rock and occasionally swigged Southern Comfort out of a bottle at a party. I didn’t have time, or I didn’t feel that I had time, to consider my options. I didn’t have the confidence to ask the bartender for a recommendation — he’d call me out as the amateur I so clearly was. I asked for a martini on the rocks, and my friend asked for the same. We gathered up our drinks and slunk to a little table where we gingerly slurped at our very bad ideas. We weren’t ready for the glassy burn. Our young palettes were in no shape for astringency. I was nervous, I lacked vocabulary, and I ended up with something I didn’t want. Shake well with cracked ice in a chilled cocktail shaker, then strain into a Collins glass half-full of cracked ice and top off with champagne. Although come to think of it: what would have happened to me if I'd actually liked the first drink I ordered in a bar?